Citizen science expands scientific inquiry and research from academics, researchers, and clinicians to include volunteers “outside the lab,” if you will, many of whom do not have formal scientific training. Volunteers — individuals and large networks of people — aid scientific projects through observations, calculations, and other support efforts. Here’s a list of a few apps and websites that take advantage of the cellphone’s camera and/or GPS, that would make good tools for budding scientists. 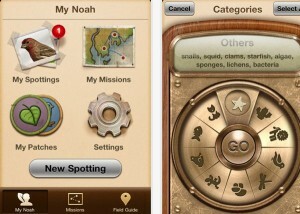 Project Noah lets you document the wildlife around you. You can post a new spotting, upload photos, tag plants and animals with location data, join missions, and earn patches. The app also contains a field guide to help you identify the wildlife you find. It’s beautifully designed, and available for free for both iPhone and Android. iNaturalist is a social network for nature-lovers. It’s an online community where you can record and share your observations from the natural world. iNaturalist has just released an iPhone app that lets you log the plants and animals you come across. If you need help identifying things, the rest of the iNaturalist community can help. The WildLab has two apps currently available for the iPhone — Crab App and WildLab Bird — and you can sign up as a spotter via its website. The WildLab Bird app, as the name suggests, involves identifying and geo-tagging bird species. The Crab App helps collect information about horseshoe crabs, their numbers and their egg-laying. There’s no mobile app for Project Squirrel, but what I love about this citizen science project nonetheless is the recognition that almost everyone — no matter where they live — has squirrels in their neighborhood. That, along with the differences between the gray squirrel and the fox squirrel — in appearance, in habitat — make Project Squirrel a great introductory citizen science project. The website lets you record your squirrel observations and upload photos. You can even mail in your data via a printable form. Read more about Citizen Science projects.